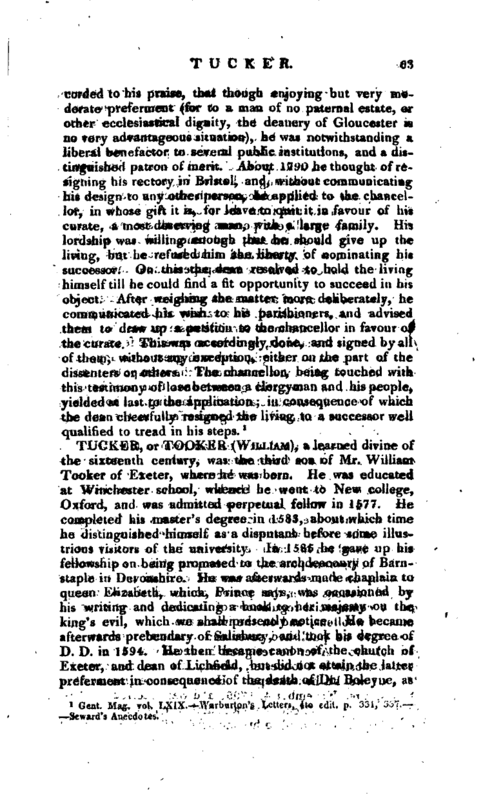 , a learned divine of the sixteenth century, was the third son of Mr. William Tooker of Exeter, where he was born. He was educated at Winchester school, whence he went to New college, Oxford, and was admitted perpetual fellow in 1577. He completed his master’s degree in 1583, about which time he distinguished himself as a disputant before some illustrious visitors of the university. In 1585 he gave up his fellowship on being promoted to the archdeaconry of Barnstaple in Devonshire. He was afterwards made chaplain to queen Elizabeth, which, Prince says, was occasioned by his writing and dedicating a book to her majesty on the king’s evil, which we shall presently notice. He became afterwards prebendary of Salisbury, and took his degree of D. D. in 1594. He then became canon of the church of Exeter, and dean of Lichfield, but did not attain the latter preferment in consequence of the death of Dr. Boleyne, as | Wood and Prince say, for he succeeded Dr. Montague, and was installed Fei>. 21, 1604. These biographers inform us that king James designed him for the bishopric of Gloucester, and that the conge d’elire was actually issued, but for some reason the king was pleased to revoke it. 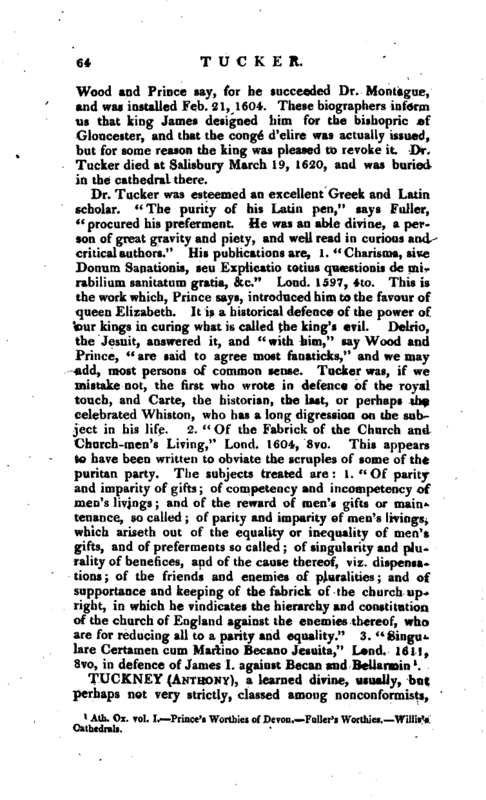 Dr. Tucker died at Salisbury March 19, 1620, and was buried in the cathedral there. Ath. Ox. vol. I Prince’s Worthias of Devon. Pullers Worthies. Willis’s Cathedrals.